We thought it was time to write a little blog all about the trendiest plant on the scene at the moment. If you haven’t heard of a Monstera, we have compiled all there is to know from the Latin plant name, to the care instructions and the hottest hashtags online. We hope you enjoy learning a little more about this big and beautiful green plant that really is the current king of the indoor jungle! Most commonly known as a Monstera, or the full plant name of Monstera Deliciosa. However, this is also widely recognised as a Swiss Cheese Plant or just Cheese Plant, due to its very distinctive, holey leaves. Where is this plant from? The Monstera is native to the rainforests in South America, but now we see it grown primarily indoors for its stunning green foliage. In its tropical habitat the Monstera actually produces fruit, a sweet, strong scented fruit which is perfectly safe for human consumption! This is where the name “Deliciosa” comes from meaning “delicious”. Unfortunately, it is incredibly difficult to force this plant to fruit so you are far more likely to see it growing and developing more and more of its stunning split leaves. Why do we all love Monstera? Much like any trend, it’s tricky to know where and when it started, but over the last 18 months we have seen the trend for green plants and leaves everywhere. From the catwalk to the interior design world, to stationary and crockery. The Monstera offers a lot, if it is green and leafy you are craving! These plants produce some pretty big leaves- perfect for brightening up a corner of any room. The large, glossy heart-shaped leaf which, as the plant matures, produces the much-loved split leaf, can grow leaves between 20-90cm! It is thought that the reason the leaf splits is to allow sunlight to be captured more regularly throughout the plant. They grow pretty tall too, capable of reaching 20m (which is about a 6 storey house), if of course you had the space and with many years of love and attention! For a novice indoor plant lover, these really are a great choice. 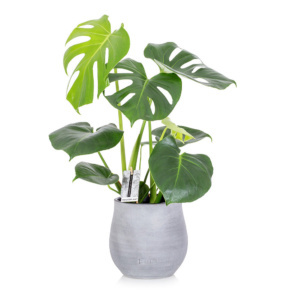 Not only bang on trend, when ordering from us at The Little Botanical, we supply our fabulous Monstera in our signature Grey concrete ceramic. These gorgeous green beauties are very easy to care for and fast growing too, so a real must for any indoor jungle. These guys are pretty straightforward! Water once or twice a week minimum and keep in a sunny spot! The more you water the more leaves you will get. They like the warmth of a house and will be very happy in the Summertime. We don’t recommend re-potting your Monstera into a new plastic pot for about 6 months. At this stage, if you want it to get bigger, then pop it in a bigger pot and see him grow! When you get a new leaf this will come through in a lighter green and start all curled up, but will uncurl to unveil a beautiful brand new bit of life! Check out the hashtag #monsteramonday on instagram and see some of the most stunning Cheese Plants out there. This crazy hashtag has over 85,000 posts. And the tag #monstera a whopping 405,000 people have tagged that in their picture. This really is proof that the world has gone a little Monstera Mad, so why not jump aboard and see what all the fuss is about.